Habit: Annual, perennial herb from crown, generally unarmed; hairs generally present, simple or branches 2, from base, parallel to leaf surface, unequal or not. Stem: 0 or prostrate to erect. Leaf: odd-1-pinnate (or palmately compound); leaflets generally jointed to midrib, entire; stipules membranous, lower fused around stem into sheaths (stipule sheaths) or not. Inflorescence: raceme, head- or umbel-like or not, axillary; flowers 2--many. Flower: bilateral; keel petals with small protrusion at base locking into pit on adjacent wing; 9 filaments fused, 1 free; ovary (and fruit) generally sessile, style slender, stigma minute. Fruit: generally 1- or +- 2-chambered, often mottled, generally +- dry in age, sometimes deciduous (falling from plant with or without pedicel, calyx, receptacle) before dehiscence. Seed: 2--many, smooth, compressed, +- notched at attachment scar. Species In Genus: > 2500 species: +- worldwide (380 in North America, 97 in California, including many rare taxa). Etymology: (Greek: ankle-bone or dice, perhaps from rattling of seeds within fruit) Note: Difficult; flower and fruit needed for identification; fruit said to be "deciduous" dehisce only after fruit has separated from pl; many good species appear similar; some species complexes need study. Taxa near province boundaries may appear in > 1 key. Varieties keyed under species for simplicity; species with varieties so identified in key. Fruit length including beak and any stalk-like base unless fruit body specified; fruit depth is suture-to-suture axis. Astragalus tephrodes A. Gray var. brachylobus (A. Gray) Barneby in southwestern Utah, Arizona, near California. Habit: Annual, +- perennial herb; minutely strigose. Stem: prostrate to erect, 6--15 cm. Leaf: 2--8 cm; leaflets 7--13, 5--15 mm, +- narrowly elliptic or obovate, tips acute or shallowly notched. Inflorescence: flowers 6--10, ascending to reflexed. Flower: petals pink-purple, wing tips often paler, banner 7.8--10.4, recurved +- 90°, keel 5.9--6.6 mm. Fruit: spreading, 15--25 mm, 11--15 mm wide, ovate, bladdery, sparsely strigose, rarely +- glabrous, thinly papery; beak compressed side-to-side, widely triangular; chamber 1; ovules 19--24, suspended from flange 1--2.5 mm wide. Chromosomes: 2n=22. 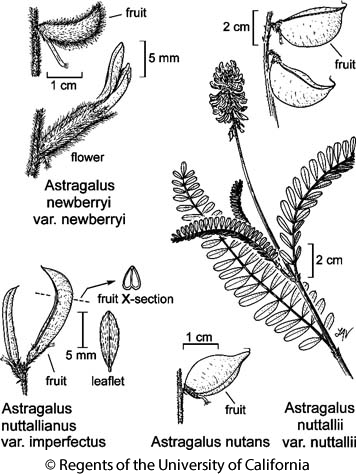 Citation for this treatment: Martin F. Wojciechowski & Richard Spellenberg 2012, Astragalus nutans, in Jepson Flora Project (eds.) Jepson eFlora, http://ucjeps.berkeley.edu/eflora/eflora_display.php?tid=14959, accessed on April 24, 2019.
se DMtns, DSon. Markers link to CCH specimen records. Yellow markers indicate records that may provide evidence for eFlora range revision or may have georeferencing or identification issues. Purple markers indicate specimens collected from a garden, greenhouse, or other non-wild location.